Elsewhere in the world, many Native cultures were treating pregnancy and childbirth with great ritual. Seen as all part of the human life cycle, women created deliberate circles to welcome mothers-to-be, to honour the emotions they were feeling, and to prepare for the act of giving birth. The journey into motherhood was seen as life-changing and powerful, full of great reverence and equal fear. Centuries later, we have drifted miles away from either of these paths. It’s clear to us today that the threshold into motherhood is a physical, logistical, and emotional journey. And that a good transition contains a solid balance of all three. The paths today have perhaps been determined more by medicine and mindset than by culture. The movement to return to simpler and more natural ways of giving birth (think midwife/doula) has given us the message that some new mothers intend to enter motherhood deliberately and under their own power. For some women, the idea not taking that journey solo leads them back to the rituals created years ago in the Native tradition: being surrounded by women who care about you, who will care for you, and will shepherd and support you right through this awe-inspiring time. One woman asked: "do I have to get pregnant to have a ceremony like this?" That was the case with Tara, who lives intentionally and treats the earth with great kindness. Her mother, who recognized a “Mothering Ceremony” as a perfect gift for her daughter, provided the space for 12 wise women to gather. The rituals, specifically designed for her, prepared her for the transition from carefree maiden to responsible mother.There were heartfelt stories shared about first births, meaningful (and ‘well-meaning’) advice. We celebrated her and her journey. And we made a solid commitment to be there for her before, during, and after the baby was born. The women who attended would have been there for her anyway, but this ceremony made it intentional. It focused on Tara’s needs, especially the emotional ones that accompany any unknown journey. Tara was wearing her birthing necklace as baby Amelie was born. And we were all wearing our ‘umbilical cord’ bracelets. 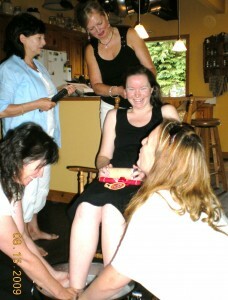 Tara described her ceremony as: A truly unique and uplifting experience that honoured my shift to motherhood with the strong and wise women in my life.